The armor used in the Middle Ages was gradually perfected, until at length the knight became a living fortress. A Medieval Knights Armor was vital on the Battlefields of the Middle Ages. The Knights Armor provided essential body protection from the various weapons which were used in battle including the two-handed sword, bow and arrows, crossbow, battle axe, mace, dagger and lance. Padded garments and Chainmail were used prior to the development of suits of Armor and subsequently worn in conjunction with the armor suits. A Medieval knights armor was designed and developed to protect them from any new, and even more lethal, weapons that were introduced during the violent period of the Middle Ages. Medieval Knights suit of armor was extremely expensive to produce. A knights suit of armor had to be tailor-made to fit the knight exactly. Any Incorrect sizing of a Knights suit of armor would be extremely dangerous as it could hamper the knights ability to fight. 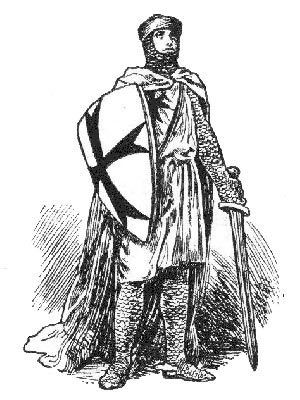 The knights suit of armor was also a status symbol. The better quality of the Knights suit of armor, the more important was the Knight. Plate Armour was first introduced during the late 13th century and Full Plate Armour was introduced during the 15th century weighing approximately 50 lbs. A knights suit of armor was strong enough to protect the knight, but light enough to allow quick movement on the battlefield. A Medieval Knights Armor was a complex series of garments, chain mail and iron plate. The Parts of a Knights Suit of Armor were a complex series of garments, chain mail and iron plate. The pieces of a Knights Suit of Armor covered the most vulnerable parts of a knight's body. The Parts of a Knights Suit of Armor are best described by explaining the parts of the body which they covered. A Dagger, called a roundel, and Sword were attached to the Knights belt. A shield was carried for defence and recognition purposes and displayed the Knights heraldic blazon. Spikes called Gadlings were attached to the knuckles of gauntlets. Each section of this Middle Ages website addresses all topics and provides interesting facts and information about these great people and events in bygone Medieval times including Knights Armor . The Sitemap provides full details of all of the information and facts provided about the fascinating subject of the Middle Ages!